The proposal is to build an extra bedroom and bathroom extension on the front of a bungalow situated on a steep hill with terraces. The property is a modern house, build circa 1970, which currently has two bedrooms and small shower room. The clients wish to build an extra bedroom and bathroom for visiting family. The extension is located below the existing bungalow, which is raised on the hillside. In order to access the higher level of the existing house, a new enclosed staircase is required. The proposal is to dig underneath the existing balcony on the south-facing front of the house in order to attain an acceptable head height. 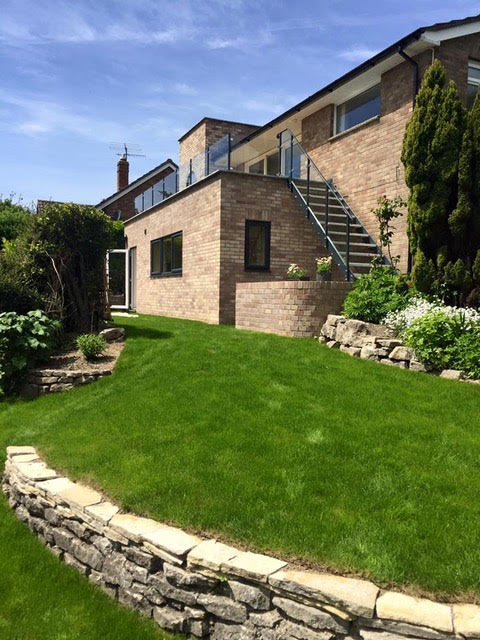 The extension would extend a short way into the garden and be accessed via a new hallway from the garden on the lower level, or, from above, via a staircase on the west side of the existing house. This staircase would be accessed from the living room and will be a spiral staircase with a landing. The design of the extension will be perceived as fairly lightweight in character, with a partially glazed door in the hallway and glass windows, echoing the position of the existing glass doors on the floor above. The tower that encloses the staircase will have a round window to give light into the stairwell and act as an interesting focal point on the south side of the house. The roof of the extension will form a balcony for the living room, as is currently the case. The extension will be built of brick to match the existing brickwork. The windows and glazed door will be of grey UPVC. The roof balcony will be of timber decking, with a timber staircase leading down to the garden as at present. The roof of the stair tower will be lead clad with a concrete coping. The extra bedroom space will not extend the existing house in a way that is disproportionate with its current scale and will not impinge negatively on the garden, the bulk of which is to the west side of the house. The balcony will be virtually the same depth as the existing one and the small amount of roof protruding beyond it will be used for arrangements of plant pots and decorative stone. In conclusion, the modest bedroom and bathroom extension makes minimal impact on the existing house and the side tower is subservient, while still having identity in relation to the main house. By echoing the position of the upper glass panels, the windows on the lower level preserve the unity of the whole and give the whole facade coherence in keeping with the original house so that the extension will not be perceived as an addition so much as a natural use of the lower space offered by the terraced hillside.